يشكل فندق On The Beach Resort Bribie Island بموقعه الممتاز في قلب ووريم نقطة انطلاق ممتازة لاستكشاف جزيرة بريبي. يمكن من هنا للضيوف الاستمتاع بسهولة الوصول إلى كل ما تقدمه هذه المدينة النابضة بالحياة. يوفر الفندق بفضل موقعة الجيد وصولاً سهلاً إلى أهم معالم المدينة.
. يعمل On The Beach Resort Bribie Island على ضمان إقامة مريحة لضيوفه من خلال خدماته الممتازة وحسن ضيافته. يقدم الفندق تسجيل وصول/خروج سريع, تخزين الأمتعة, صف السيارات, مرافق للشواء, تأجير سيارات لضمان الراحة القصوى لضيوفه. تنعكس أجواء On The Beach Resort Bribie Island في غرف الضيوف.تلفزيون بشاشة مسطحة, حوض الاسترخاء, غرف لغير المدخنين, مكيف هواء, تدفئة هي بعض الميزات الموجود في العديد من الغرف. يقدم الفندق مجموعة واسعة من وسائل الراحة المتنوعة، كمثل: حمام سباحة خارجي, حديقة. استمتع بخدمات لا يعلى عليها وعنوان ذو اعتبار في On The Beach Resort Bribie Island . This was really great value for money. Such a great location and such a relaxing holiday. When we booked, we saw in the comments that some were complaining on no ocean views on level 2. We requested a room with the best ocean view and the room they gave us was great. I can see how some of them might have te view obscured though, so of you're worried about that, best to contact staff, they are very accommodating. Also, late check out was excellent value compared to other places. Great location very friendly staff and beautiful views. The staff were great. The views lovely and the position perfect for relaxing, but also close to parks for kids and eateries. Our stay On The Beach Resort Bribie Island was very relaxing. Being so close to the beach was just great especially as we didn't have to cross any busy roads to get to the beach. The accommodation was superb and I would happily stay again or recommend it to any of my friends. Amazing views, easy walk to the beach, close proximity to cafes and restaurants. We really enjoyed our accommodation and stay at On the Beach. We stayed in a two bedroom 4th floor apartment and it was really well equipped. We were on Bribie Island for my sons wedding so not of time to relax at the apartment. If I was staying for a holiday I would think a bar-b-que on the balcony would be a positive and en extra chair on the balcony - there were only three. There is no dining facilities at this resort that is why I have rated it so low. Not that it was a negative - as mentioned above there were cafes etc in easy walking distance. 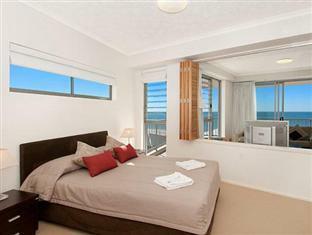 Proximity to beach, coffee shop, shopping centre & hotel. Our stay was very relaxing & enjoyable. Everything we needed was handy and all the locals were very friendly. Waking up to the sun streaming in our window was a lovely change to winter in Melbourne. The beach was superb & everything was clean & well kept. As our room fronted towards the beach, we had magnificent views & no traffic noise from the street.